Following two previous successful instalments of the Rolls-Royce Summer Studio in Porto Cervo, the luxury car manufacturer will once again be heading to Sardinia with its seasonal pop-up store. Launching in June to coincide with the beginning of the international summer season, the pop-up will be located within the walls of Promenade du Port in Costa Smeralda and just metres from the resort’s main superyacht marina. After 2015 offered visitors the chance to put a fleet of Phantoms, Wraiths and Ghosts through their paces, 2016 is all about the impressive new Dawn. Launched a matter of months ago, the super-luxurious Rolls-Royce Dawn Drophead Coupé has been hailed as the marque’s most sociable car to date and the pop-up will offer superyacht owners and their guests the chance to be one of the first to drive it. Of course, should you be suitably impressed by your experience on Sardinia’s best coastal roads Rolls-Royce representatives will be on hand to take orders and arrange bespoke commissions. For inspiration simply look to the one-of-a-kind Limited Edition Dawn created specially for the Summer Studio and inspired by Costa Smeralda that will be on display throughout the summer. 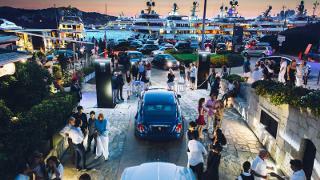 The Rolls-Royce Summer studio will be open from June – September 2016 at Promenade du Port, Porto Cervo. Visit rolls-roycemotorcars-portocervostudio.it for more information.